This documentary examines the life of one of the most successful clairvoyants in history and a pioneer in the struggle for women's equality. 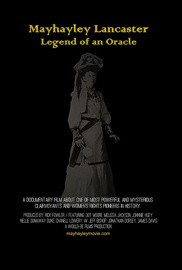 This documentary examines the life of Mayhayley Lancaster. She was one of the most successful clairvoyants in history and a pioneer in the quest for women's equality. She was born in 1875 in a rural area of western Georgia. She was delivered wearing a “caul” (membrane) over her face. According to folklore, those born with “the veil” have special powers. She had one eye and placed a gaming marble in the socket of the missing eye, creating a grotesque look. Mayhayley insisted on walking everywhere and was constantly followed by a pack of loyal dogs, even into the Methodist church she attended. She accurately predicted the accidental death of a young woman hours before it happened and located a missing drowning victim, describing his exact location and body position. She solved a nationally-famous murder case by sharing her psychic visions with both the murderer and law enforcement. This brought thousands of knowledge-seeking people from all over the United States to her dilapidated Civil War-era cabin in the woods. Mayhayley Lancaster was the first woman to run for the Georgia state legislature. Her progressive platform was decades ahead of its time.